Sooooo, U. 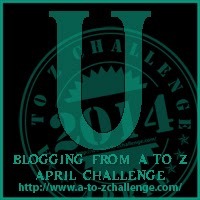 The A to Z challenge letter that has been the undoing of my existence, because I was going to write about unicorns. Then, I couldn’t find the unicorn art I painted once upon a time. It was shiny with some glitter in iridescent acrylic paint. Why, yes, I’ve always been this unique. Of course, there’s always room for Montesque, the delicate, pink unicorn in my middle grade fantasy, State Secret Keepers. He may be an unabashed pink, but he’s not a girl. Just sayin’. While I was searching for the elusive artwork, I found my photography portfolio from the ol’ college days. I found a couple of unexpected photos that I’d forgotten about. My brother is the subject of two images that have unusual activities, so what better way to write about U? 😀 These photos were quite useful. My printer/scanner is broken (dare I say “uncooperative“), so I had to take pictures with my phone. Grrrr. My brother was a good sport about setting up these unhinged photos for my assignment. The shower is unsubtle. Can you spot the unexpected in the tennis photo? Also, this week, I was unexpectedly invited to go on a field trip to a nature center with Armadillo’s class. Three other parents had turned down the invitation to usher the students around the facility. Unbelievable! If I don’t have meetings and can unschedule my work, my daughter’s teacher doesn’t have to ask me twice. I’m so there. It was an uncloudy day, and umbrellas were unnecessary while we hiked the trails. We visited the butterfly hut and saw this swallowtail callipitter (yes, that is a word at my house). It was undulating all over its food. Sorry, I really wanted to use another U word. 😀 And since the midnight hour has undone me and I’m slightly unawake, I’m posting this before I can edit all the U words out. What about you? Any unexpected or unusual or not unhappy things going on in your world this week?